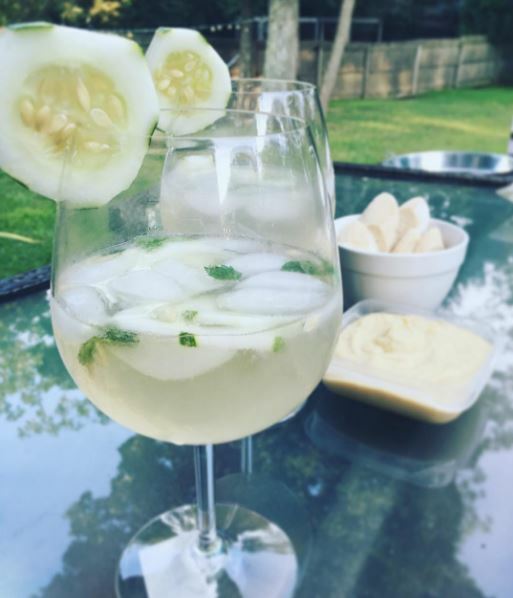 Delish Drinks – Damn, I Can Make That! Ok, guys. 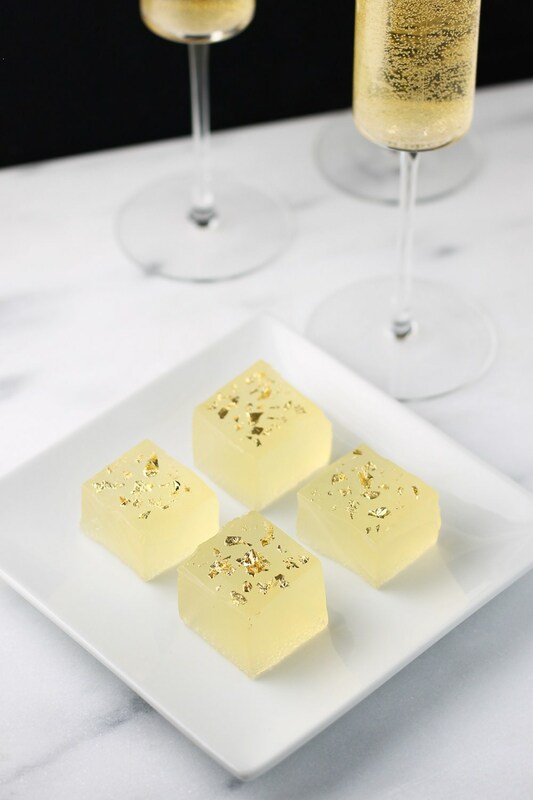 We’re about to get next level with jello shots – champagne jello shots! The minute I saw this post from Sugar and Cloth I knew I had to share it with you all. Especially with New Years’ Eve right around the corner, these are the perfect compliment to that champagne glass in your hand. Cheers, darlings! Combine the simple syrup and lemon juice in a cocktail shaker filled with ice. Shake well, then pour into a medium saucepan and sprinkle with gelatin. Allow the gelatin to soak for two minutes, then heat over very low heat, stirring constantly, until the gelatin is fully dissolved (about 5 minutes). Remove from heat and add the gin and Champagne, stirring well to blend. Pour into a very lightly greased loaf pan and chill until fully set, several hours or overnight. Turn out the set gelatin onto parchment paper, then slice carefully (a thin knife works best) into rectangles or squares. Garnish with edible gold leaf using a paintbrush (use one you can reserve for food only — you don’t want paint chemicals in your food!). Gold leaf crumbles and sticks to things (like fingers!) easily, so be gentle — just pull off tiny corners with the brush (they will stick), then place them gently on top of the gelée squares. *If you don’t have simple syrup here is a simple easy recipe. In a small sauce pan over medium high heat, add 1 cup of sugar and 1 cup water. Bring it to a simmer. Watch it closely for roughly 5 minutes until it has a syrupy consistency. Happy Eating (and Happy New Years’! ), XO. In honor of International Coffee Day yesterday, we’re bringing you an international coffee recipe! I’m sure by now you’ve heard of cold brew coffee. Especially now that Starbucks has started featuring it. For those of you who aren’t sure about it: No, it’s not cold coffee. You can still drink it hot. Yes, it’s so much more delicious, flavorful and fresh than regular brewed. No, you don’t have to use it all at once. It can stay in the fridge for up to two weeks. Yes, it gives you an excuse to use one of your cute mason jars for real (and not just decoration). My British friend (told you this would be international) recently introduced me to this British fellow, Mike Cooper, after discussing homemade cold brew coffee. I thought I needed huge special equipment and my own goddamn coffee tree to make cold brew. But therein lies the beauty – you only need a bowl and a strainer. (Oh, and that cute mason jar.) That’s it. However, I will warn you – it does take about 24 hours to make, but it’s well worth the wait. Trust. In a large bowl, pour in the coffee grinds and water. *If you’re making cardamom coffee, mix in the pods. Cover it with a tea towel and place in the fridge. Our British fellow says to leave it for 20 hours but I’ve been doing between 24-28. You’ll see a nice foam at the top when you take it out. After the wait is finally over, you’re going to strain the grinds. If you’re using a sieve, strain the coffee into a medium sized bowl. Once strained, covered another bowl with the paper towel and pour the coffee over it. If you’re using paper towel, you’ve already cut to the second part and will only need to strain once. Cover a medium sized bowl with the paper towel and pour the coffee over slowly, letting it strain through. At this point the coffee is really concentrated, but it gives you the freedom to choose how strong you want your cup to be. Pour a little coffee into a cup, and using piping hot water (or cold for iced coffee) fill it to your liking. 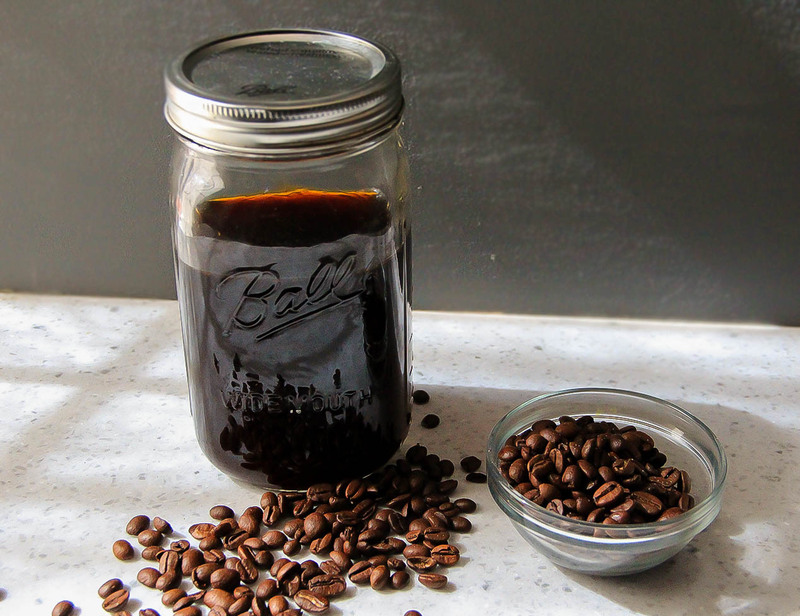 If you’re a big fan of iced coffee like my husband, you can also use the concentrate to make a few iced cubes for next time. Although the days are getting shorter (I’m sure we don’t need to remind you), summer cocktails aren’t going away just yet! Sure, rose slushies are a thing, but somehow I keep coming back to gin. It could be because I’m pumped to use Wolffer Estate’s new pink gin, or it could be because it’s just so good and versatile. There are countless ways to make a lemon, cucumber, something or other cocktail. And here’s one of those delicious variations. Let’s get one more cocktail in before the end of summer, shall we? In a cocktail glass, muddle together the lime juice, simple syrup*, mint leaves, and cucumber. Top with ice, gin, St. Germain, and seltzer water. Garnish with a cucumber slice. And we’re back! After taking a couple of weeks off to get our lives together, we’re coming back in a strong way – with a strong cocktail. (We know you missed our corny jokes…). I went in to HomeGoods the other day just to browse…as if anyone actually makes it out alive without buying anything…and came out with these awesome, old school cocktail glasses. I had to use them that night. Obviously. I used my juicer for the cucumber juice, but you can also muddle it (get in a workout while you’re at it), or a blender. Place all of the ingredients in a cocktail shaker with ice. 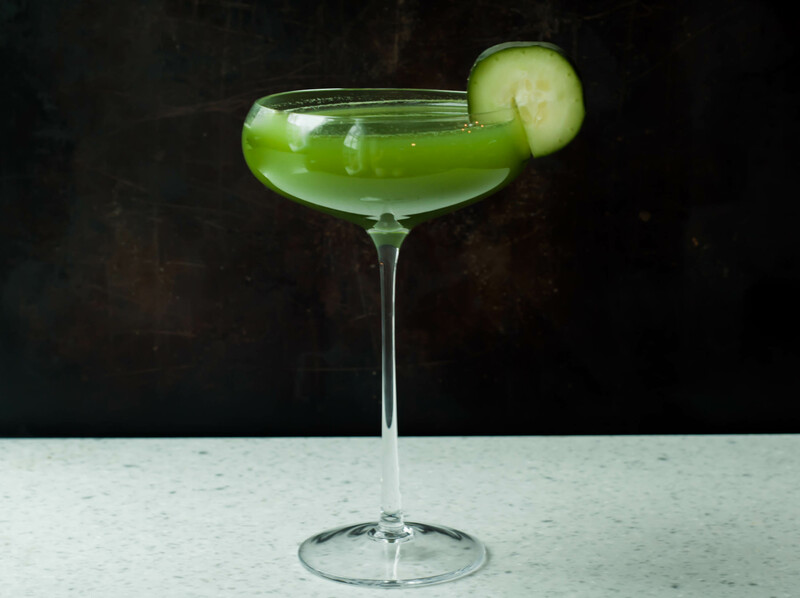 Strain and garnish with a cucumber slice.